The path to true love is never easy… but it’s always worth it. Nova Velez, a sassy Dominican, has a busy life, working two jobs, volunteering at the hospital, and finishing graduate school. It’s all necessary to fulfill her dream of helping troubled children. To graduate, she has to complete her school counseling internship, but it won’t be easy working with depressed, hormone-addled students. When she meets her distractingly handsome mentor, Bryce, a health conscious vegan, and the jealous, domineering principal, things become more complicated. When sparks begin to fly between her and Bryce, complicated takes on a completely new meaning. 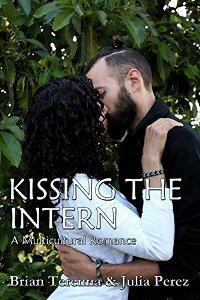 I was inspired to write "Kissing the Intern" because of my loving fiance.